Seacookie came out feeling really good in the warm up today at Burghley but unfortunately as soon as I jumped out the start box it became clear he wasn’t enjoying the ground on course and really wasn’t feeling himself. He had a serious look at Leaf Pit Classic at fence four and then was very sticky at Discovery Valley, fences 6 & 7. I just wasn’t happy with him and so decided to pull up before the Trout Hatchery complex. He has come back to the stables looking absolutely fine, there doesn’t seem to be anything amiss and he will be back to fight another day. It was then a long wait until Parklane Hawk. The course was causing it’s fair share of trouble and was proving particularly difficult time wise, with only Andrew Nicholson and Sinead Halpin having gone inside the time by the time I had to get on. I am very proud of Sinead, I have followed her progress closely since she spent time with us a few years ago and she put in an absolute master class of a round. I am sure that today’s performance more than made up for her disappointment of missing out on a Team USA call up in London. Parklane Hawk has definitely known where he is over the last few days and he jumped out of the start feeling like pure class. He was much better at the Leaf Pit this year and popped down in a much more measured way than last year! I was concerned about the Discovery Valley for him as he is a very bold horse but he popped through on three strides really neatly. All the distances I had concerns about he made feel very easy. He is certainly a horse that is made for Burghley, he was just extraordinary and galloped all the way to the line, finishing full of running. It was extremely frustrating to have lost 5 seconds around the course resulting in 2.4 time penalties but because he is very so bold I felt I had to be careful later in the course. I needed to make sure he respected fences like the Planet in the main arena as this had caught a few horses out earlier in the day. I am annoyed at myself but really couldn’t be happier with Parker! We are sitting in third place, 7.1 marks off the leader going in to tomorrows show jumping phase and there is still a lot to play for. Sinead is leading with a pole in hand over Andrew Nicholson (Avebury), I sit just 1.6 marks behind Andrew and Oliver Townend (Armada) is just 0.1 behind me. To see the full results from today click here. 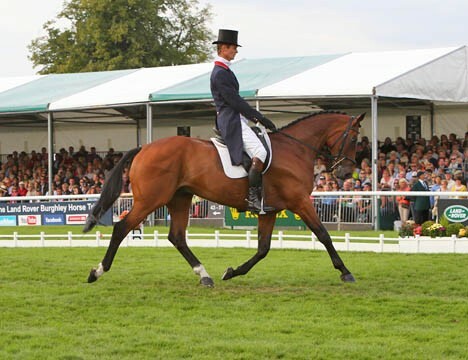 William & Parklane Hawk during yesterdays dressage test at Burghley.